Anderson Cooper anchored AC360 from the NYC studio. Included was a segment on the latest remarks from Republican Presidential Candidate Donald Trump. Enjoy! Anderson Cooper anchored an expanded 2 hour edition of AC360 from the NYC studio. AC360 tweeted about an interview Anderson did with Glen Campbell's wife and daughter that didn't make it to air last Friday. It was to promote the CNN Documentary on Glen Campbell's life with Alzheimer's. If you are a fan of Glen Campbell's or someone wanting to know more about a personal struggle with Alzheimer's you will enjoy the documentary. It's title Glen Campbell, I'll Be Me. It originally aired Sunday evening on CNN, but I'm sure CNN will repeat it. And he anchored an expanded two hour edition of AC360 from the NYC studio. We ran across this photograph of Anderson with his dad and Carter in out archives and thought today would be a good day to share it. We hope all fathers; past, present and future had a Happy Father's Day! Anderson Cooper anchored an expanded two hour edition of AC360 from Charleston, SC on Friday night. It was two hours full of reports, interviews, remembering the victims and the sights & sounds from Charleston. Anderson Cooper anchored AC360 Live from Charleston, South Carolina tonight. There were reports, interviews and remembering the victims. Anderson did state that he would be in South Carolina tomorrow (Friday) and tomorrow night. 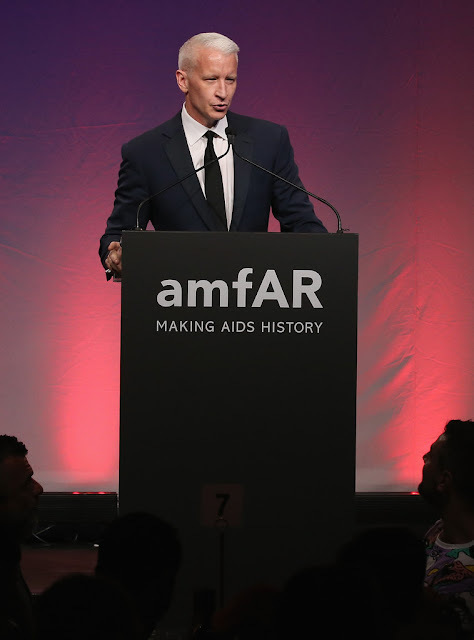 Anderson Cooper was in the NYC studio anchoring AC360 live on Wednesday night. Anderson anchored a taped edition of AC360 on Tuesday night. In one of the panel segments from last (Monday) night's AC360, Anthony Gangi, a former corrections officer, got a little heated in a discussion with Jeff Toobin. Toobin handled himself well. Anderson Cooper anchored a two hour expanded edition of AC360. Anderson Cooper anchored AC360 from an undisclosed studio in Florida. There were Twitter sightings of him earlier in the day in Miami. Anderson and Anthony Bourdain talk Spam and Hawaii. Tomorrow, Saturday, Anderson is the keynote luncheon speaker for Collaborate Marketplace in Orlando, Florida. Anderson Cooper anchored an extended 2 hour edition of AC360 from what appeared to be the CNN LA Bureau. Anderson Cooper anchored AC360 from the NYC studio.